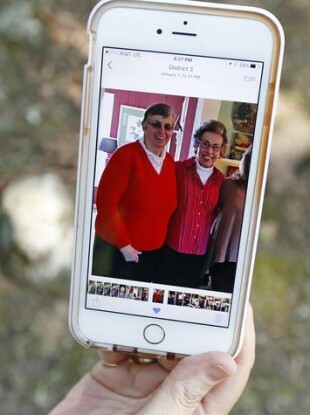 Jamie Sample, a parishioner of St. Thomas the Apostle Catholic Church in Lexington, Miss., sits in the shade in Durant, Miss., and shows a smartphone photograph taken last December 2015, of Sisters Paula Merrill, left, and Margaret Held. TWO NUNS WHO worked as nurses and helped the poor in rural Mississippi were found slain in their home yesterday, perhaps victims of a break-in and vehicle theft, officials said. Authorities would not say if they have a suspect but disclosed that they’d recovered a car missing from the home and were taking it to a crime lab for analysis. They also did not release a cause of death, but the Reverend Greg Plata said police told him the sisters were stabbed. The nuns were identified as Sister Margaret Held and Sister Paula Merrill, both 68. Their bodies were taken to a crime lab for autopsies. The women, both nurse practitioners, were found yesterday morning when they didn’t report to work at a nearby clinic, where they provided flu shots, insulin and other medical care for children and adults who couldn’t afford it. The two nuns provided almost all the care at the clinic, and many in the community wondered what would happen to it now — and the people it served. Maureen Smith, a spokeswoman for the Catholic Diocese of Jackson, said there were signs of a break-in at the home and the nuns’ vehicle was missing. Later, Warren Strain, spokesman for the Mississippi Department of Public Safety, said the blue Toyota Corolla was found abandoned last night on a secluded street barely a mile from the home, the vehicle apparently undamaged. He said police haven’t determined when the car was abandoned and it was being towed to the state crime lab near Jackson, Mississippi’s capital city. “I have an awful feeling in the pit of my stomach,” said Durant Assistant Police Chief James Lee, who is Catholic. Police Chief John Haynes said officers are checking video from surveillance cameras in town to see if they spot anything unusual. “We simply do what we can wherever God places us,” Merrill said. Email “Nuns who ran clinic in poverty-stricken Mississippi community found dead in their home”. Feedback on “Nuns who ran clinic in poverty-stricken Mississippi community found dead in their home”.